Smart technology specialist Chris Davies single-handedly transformed his 30-year-old villa in southern Portugal into a sun-kissed showcase of splendor, security, and simplicity. 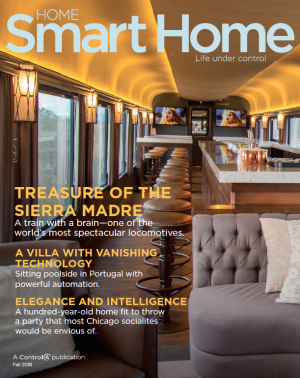 Smart technology breathes new life and luxury into one of the world’s most spectacular railroads. Mexico’s much-loved tourist train, El Chepe, even knows where it is and can share on-screen stories about its surroundings to enlighten and delight passengers. Although bathrooms and kitchens commonly received most of the makeover money, maybe it’s time to take a good, hard look at some of the lesser-used areas of your home and apply your remodeling dollars towards converting them into fun, functional spaces. This luxurious property is truly a work of art. It contains unique furnishings, exotic decorations, and luxurious amenities, including a state-of-the-art smart home system and in-home golf simulator. A Chicago socialite’s spectacular 1917 row house has been transformed with the help of smart technology. But its contemporary elegance and sophistication retain echoes of its colorful celebrity history. It takes a community to raise a house that’s so efficient it produces excess power to sell back to the local utility. It requires environmentally conscious design and construction, plus a bevy of green, eco-friendly products and systems to put a residence on a path toward achieving the coveted Platinum LEED (Leadership in Energy & Environment Design) rating. And, it paints a realistic picture of how technology can play a role in promoting a cleaner, healthier and greener way of living. A newbie installer smartens up a top floor in Texas. Automation gives a Texas homeowner the power to live happily ever after. A suburban street in Texas has no residents, but lots of smarts. A New York City church becomes a smart home, with a surprise interior. When Martin Bobak, owner of the Tilted Kilt in Illinois, wanted to make his restaurant an entertainment knockout, he contacted Control4 integrator Procom Enterprises to design an automation system that would add a high-energy, American twist to his traditional pub. From the sleek, in-wall Control4 Touch Screen residents can retrieve messages, connect to the concierge, valet, or make a service request with building management—all with the touch of a finger. It's hard not to judge a book by its cover. If you want to impress potential clients, you need a conference room that represents the brand of your business. Stewart Vicar has spent the better part of his life collecting Cubs memorabilia and the last four of those years to completing this incredible space. The room is a real-life fantasy zone, including two separate video walls, a theater, an arcade with vintage video and pinball game consoles, air hockey and foosball tables and two separate bar areas with seating for a dozen people. Simon Oré uses Control4 to inspire his animation work—and avoid the Hollywood runaround. Home Control and Automation Are True No-Brainers in This “High-Desert Modern” Haven. Hands Aren’t Required, Either. The classic “He-Man Hideaway” gets updated with automation. A New England family uses automation to add security and comfort to their home.